Saturday 1st - Sunday 2nd June 2019 . * The transaction fee is £1.50 for E-ticket (Print-at-home) or £6.50 for Secure Post. 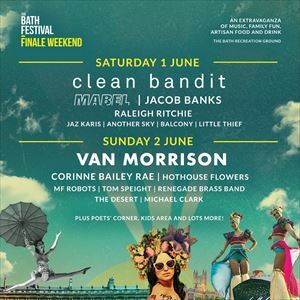 Bath Festivals and Orchard Live are proud to announce Grammy award-winning chart toppers Clean Bandit and legendary singer songwriter Van Morrison as the headline acts for The Bath Festival Finale Weekend to be held on Saturday 1 and Sunday 2 June on the Bath Recreation Ground. Clean Bandit, who have had four Number 1 UK singles and have recently been nominated for two Brit awards, headline the Main Stage on Saturday. Topping the bill on the Sunday is Van Morrison, who has been delighting audiences all over the world for five decades and has recently released his 40th studio album, coinciding with a series of shows in the US. Last summer's first ever Bath Festival Finale Weekend held on Bath's Recreation Ground was hugely popular, with festival goers enjoying performances from stars including Paloma Faith, Sophie Ellis-Bextor, Robert Plant and Midge Ure. The success of that first event has prompted Bath Festivals and Orchard Live to announce a second Finale Weekend for 2019. Once again, the event will take place on Bath Recreation Ground, right in the heart of the city within walking distance of the train and bus station. In 2016, they released their 10 million-selling single Rockabye feat. Sean Paul and Anne-Marie. Shooting to #1 in more than 40 countries and having spent nine weeks at the top of the charts in the UK, the track became the longest-running UK #1 in 22 years surpassing Wet Wet Wet's Love Is All Around. "...there was never any suggestion that Morrison, one of the most prolific recording artists and hardest working live performers of his era, would ever rest on his laurels." Awards and accolades include a knighthood, a Brit, an OBE, an Ivor Novello, six Grammys, honourary doctorates from Queen's University Belfast and the University of Ulster, entry into The Rock n Roll Hall of Fame and the French Ordres Des Artes Et Des Lettres - all attesting to the international reach of Van's musical art.